I am writing to you to avail myself of my rights under the Digital Millennium Copyright Act (DMCA). This letter is a Notice of Infringement as authorized in § 512(c) of the U.S. Copyright Law. I wish to report an instance of what I feel in good faith is an instance or Copyright Infringement. You are registered with the U.S. Copyright Office as the Designated Service Provider Agent to receive notifications of alleged Copyright infringement with respect to users of the Service for which you are the Designated Agent. Because the unauthorized copy is on a website, DMCA and other similar legislations stipulate that the host (and Google) can be asked to remove the offending site. ​3. The material in question was created as work for hire in January 2014. 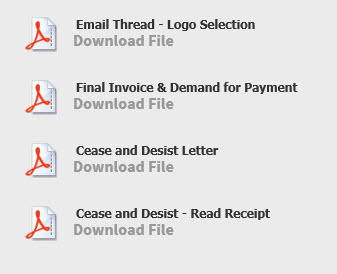 Although the client was in receipt of both the final artwork files and the bill for service, payment was never received. Subsequent demand for payment letters received no response. Furthermore, it was specifically noted in the final bill for service that "all rights to the artwork is owned by the Customer, upon receipt of payment in full." A Cease and Desist letter was sent (via email) on August 31, 2016. This message was ultimately opened/read on September 21, 2016. As of the current point in time I have received no communication regarding this issue and the logo remains in use.